Russia is shown to have every reason to seek special consideration of, as well as express its concerns over, the impact of the European Union's (EU) eastern enlargement. The latter relate, in particular, to the current and expected negative repercussions of the changes in the political and economic situation in Europe. Closer study of crucial EU enlargement issues arising as a result of the new member states (NMS) having shifted to the EU common customs tariffs and preferential systems, their adoption of the EU foreign trade regime and the standardization of cargo transit rules and regulations applicable across the EU-25 as a whole demonstrate the need for a comprehensive approach to EU enlargement. That would make for a better understanding of the multifaceted and controversial impact that enlargement will have on the economic transition and industrial restructuring processes in Russia. As the EU penetrates more deeply into the markets of the countries of Central and Eastern Europe, Russia's share in bilateral and multilateral trade as well as other joint economic activities could be reduced still further. Russia is trying to promote its own specific vision of European integration based on two pillars: the European Union in the West and Russia-initiated integration models in the East (e.g. a Single Economic Space). By taking that route, Russia could retain its political and economic influence in those post-Soviet European countries, where its strategic interests lie. The EU subscribes to a markedly different approach. In late 2002 it began pursuing its European Neighbourhood Policy (ENP) that was specifically aimed at the eastern neighbours of the enlarged EU. It has demonstrated its growing political and economic engagement with those CIS member states that are now part of the ENP. The ENP transmits a clear message to Russia; it clearly signals the European Union’s specific interests and objectives in Eastern Europe. The policy is quite explicit; it reveals that the EU intends to discuss all issues directly with the counties concerned, while the mediation of Moscow is totally or mostly ignored. As a result, a conflict of interest is becoming increasingly apparent in Eastern Europe, with the EU adhering to its ENP and Russia promoting its integration model. 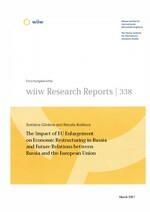 Numerous indicators of the state of relations between Russia and the EU show that however important it may be, economic cooperation is increasingly fraught with ambiguity and competition, which, in the final analysis, can but have a negative impact on the efficiency of that joint relationship.